Dr PM: There you have it - the non-existent social support structure for the common man. How many other Malaysians would have faced this when going through a similar process of paying bail? How disconnected politicians are to the plight of a common Malaysian? So, I hope this opens up the eyes for all to see that a former PM can face huge challenges also. Guilty or not is another story. What does a common man do when he cannot post bail? He goes to jail, right? So, as a leader of the common man, stop whining and walk the same path of the common man and keep your head up high while doing that. Oxymoronictendencies: Najib’s daughter Nooryana Najwa, you claim that is “unfair”. Before whining further, why don’t you ask the families of those prosecuted and persecuted by your father in the past 10 years? Ask them how “fairly” your father’s government and henchmen had treated them. You have lived a luxurious life allegedly at the expense of the Malaysian rakyat. But those days are gone. They are over! And it’s time for you to face the reality of your new circumstances. Your parents are accused criminals and are being treated far better than they deserve. In short, dear Nooryana, do stop your whining. It’s not winning any friends for anyone in your family. Please spare us this “woe is me” drama. If you want to blame someone for your current circumstances, then blame your parents. Gerard Lourdesamy: Which bank will allow them to open an account when the entire family is suspected of money laundering and allegedly living off the proceeds of crime? I suggest you go pawn the remainder of your mother's jewellery and sell her handbags to pay the bail and lawyers. I take it that your foreign funds are either frozen or under the supervision of Bank Negara, MACC and the CCID, with the help of the DOJ and FBI. So, it cannot be repatriated back to Malaysia. Good luck then. Anonymous_1527658987: Banks are reluctant to open new accounts not because of fears of angering the government but because of concerns the accounts might be used to launder money to pay bail. Lembaga Hasil Tangkapan: Perhaps Najib has the cash and tries to make it not so obvious. If he goes and pays the bail with bags of cash, it will draw more attention to him. So he has decided to blame the banks and Nooryana again becomes his mule. So the banks are right to reject him, knowing the source of Najib’s money is more than questionable. By saying "donation", Najib meant to put ideas in the public's mind so that if he didn't manage to open the bank account and instead pay with cash, he makes it seem that it is actually donations from the public. Nice try, Najib. Let's see how much of such "donations" you have. So, it is right if the judges set bail higher and higher because Najib can pay. CucuMalaysia: Spending millions on Nooryana’s wedding celebrated in grand splendour is beyond the means of a PM with a monthly salary of RM20,000. I'm sure this was with her full agreement to impress her in-laws. Unfortunately, it was done at the expense of taxpayers - unless her parents were very wealthy in their own right. But then, it's not possible because her grandfather was not. 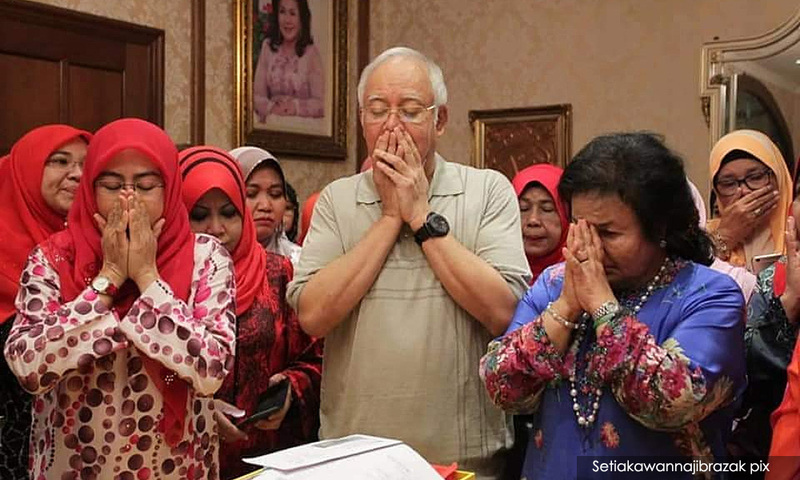 Anonymous_1527925538: Najib returned a large part of the RM2.6 billion to the Saudis. So, now that he really needs the money, he can ask them for it again. RM2.6 Billion Turkey Haram: Nooryana, the fact that Najib can raise RM6.5 million to pay bail shows that your parents still have plenty of loose change. For us, poor ordinary guys, to get a loan of a thousand ringgit is something quite difficult. What nonsense are you talking? Your parents had enough good days at our expense. It is absolutely appropriate that they taste what we ordinary fellows had been enduring all this while. It’s stupid of you to ask for sympathy from us. Go and tell that to Umno or MCA. Roger 5201: Why is Nooryana complaining when her parents are going through the due process of the law - the very same law that is applicable to all Malaysians who have committed wrongs? Since Umno operates on cash, why bother opening a bank account? Since Sungai Besar Umno chief Jamal Md Yunos has enough cash to boast about bidding for Equanimity, surely, he can have party’s supreme council member Lokman Noor Adam bring a suitcase or two of cash to your house. Cyclonus: Why is it all her posts sound the same? Always decrying the injustice and unfairness that has befallen her parents. Always demonising the present government. It's a good publicity ploy to use a young and naive looking face to cry helplessly to solicit sympathy. But, I think what your parents, your family and their cronies did to us is beyond reprieve. No amount of woeful words will repair the damage done. I don't know how much you've paid your “consultants" to draft your posts, but it sure better not be from our allegedly stolen money. Abasir: No money? This is so sad, Nooryana. But please do not fret. (Not when you are in a ‘cheap’ school like Harvard.) There is, if you ask mum and dad. Really, no need for banks and bank accounts. Tell all your donors to hand your family only cash in small bills (cash is king, remember?) and then stuff them all into Hermes and Louis Vuitton bags which are lying around all over the many palatial residences bought by grandfather Abdul Razak Hussein. (What's that you say? That he was incorruptible and died a pauper?) Okay, so the houses were gifts? Whatever. And when it comes to managing the millions that might flood your houses and condos, just call uncle Nazir for some advice. He, I understand, has some experience dealing with cold cash and distributing it to the perpetually "needy". Don't worry if people accuse you or your donors of money laundering. Just ignore them just as mum and dad have always ignored such accusers. Just one word of caution though. Vet all the bodyguards who surround your family. If they know of the cash lying around, there is every chance they will help themselves to it when you are not looking. It is known as ‘rezeki’.